Walmart Stores (WMT), which has pledged to buy an additional $250 billion in U.S.-made goods over the next decade, is hitting a snag as it tries to meet that promise: Some vendors keen to participate in the initiative complain that after decades of offshoring it has become impossible to domestically source even commonplace components for their products. So America's largest retailer has invited dozens of small- and midsize manufacturers that aren't necessarily interested in having a direct relationship with Walmart to come to Denver this week for a two-day matchmaking event. The goal? To connect Walmart vendors hungry for key parts with manufacturers that have idle plants -- and to put those plants back to work cranking out components, such as small electric motors or polyester yarn, that have become hard to find. "We're going to try to match up [vendors] who are looking for component parts with factories that have capacity in the hopes that we can rebuild that supply chain that doesn't exist anymore," said Michelle Gloeckler, the Walmart senior vice president in charge of the initiative. Critics of the retailing giant are quick to claim that Walmart, which built its empire on low prices, is partially to blame for the sorry state of U.S. manufacturing. Mary Bottari, a former trade analyst for Public Citizen's Global Trade Watch, says Walmart's push for cheap goods "has fueled a global race to the bottom in wages and working conditions." And the Economic Policy Institute, a union-friendly think tank, estimates Walmart's trade with China alone has cost the United States 200,000 jobs. Walmart disputes those claims, and spokeswoman Brooke Buchanan says Boston Consulting Group has estimated that the domestic-sourcing initiative will create 1 million jobs in manufacturing and related service jobs. 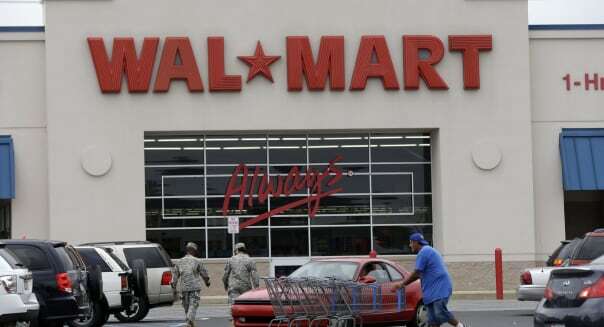 The "Made in USA" program was conceived as a way to help Walmart win back customers who have defected in recent years to even cheaper competitors such as Dollar Tree (DLTR) and Dollar General (DG). So far the effort has failed to stem a five-quarter-long decline in U.S. sales. Walmart says the 18-month-old program is a winner with customers. It hopes the Denver event, which has attracted 100 component part manufacturers as well hundreds of existing and wannabe Walmart vendors, will allow it to rapidly increase the number of U.S.-made products available in its more than 4,200 U.S. stores. But the event is also a tacit acknowledgment that the "Made in USA" pledge is harder than it might have seemed when it was announced last year. Not only are some raw materials and components hard to find, but many of the companies tempted to participate in the domestic-sourcing program are unprepared to do business with Walmart and its storied -- but complex -- inventory control and logistics system. %VIRTUAL-pullquote-By eliminating the ocean freight, what we've done is lower the overall cost of goods. So I can not only beat Chinese prices, I can obliterate them.%Walmart's suppliers say difficulties with the program do not invalidate the idea. A number of factors, including rising wages in China, plummeting productivity-adjusted wages at home and a new appreciation for short, responsive supply chains, mean they can compete with Chinese rivals. "By eliminating the ocean freight, what we've done is lower the overall cost of goods. So I can not only beat Chinese prices, I can obliterate them," says Keith Scheffler, president of Creative Things, an Arkansas toymaker that recently shuttered its last Chinese plant. Still, vendors say they are forced to go overseas for such commonplace items as zippers and snaps. Element Electronics, which makes flat-screen TVs for Walmart, has moved incrementally after finding "there was no known existing domestic supply base" when it moved assembly back to the United States, says Chief Executive Officer Mike O'Shaughnessy. The company started simple, focusing on things like packaging materials. Now it is seeking U.S.-made suppliers of plastic and metal parts. O'Shaughnessy figures three years may pass before domestic suppliers can supply all the parts Elements needs. Supply-chain problems aren't the only challenge Walmart vendors face when they join the "Made in USA" push. The retailer's "Retail Link" system presents vendors with a torrent of real-time sales, inventory and purchase information that they need to learn how to analyze so Walmart can minimize in-store inventories while keeping shelves stocked. It's a difficult balancing act that even sophisticated suppliers like Mel Redman, a former senior Walmart executive who runs Redman and Associates, a toy manufacturer that supplies the retailer, struggle to achieve. "Everything works backwards," he says. "What a vendor needs to learn to do is to work from must-arrive-by date backwards through the production schedule, lead time and lag time. It's very complicated." "August is a traditional month when next year's models are rolled out, and the rush to sell last year's inventory heats up," says John Ganotis, founder of CreditCardInsider.com. "For instance, General Motors (GM) promoted Chevrolet sales with a 'Love It or Return It' campaign that allowed customers to return new cars within 60 days of purchase. GM's no-haggle equivalent was called 'Total Confidence Pricing.' Cars were offered at about the same price GM gave its employees." Ganotis says that consumers can expect these and similar programs and specials this month. Whether you're shopping for a pre-K or collegiate living, back to school sales are your best friend. "Many stores have already cut prices on supplies by up to 30 percent and are offering [buy one, get one] deals now," says DealScience.com, which delivers shopping intelligence. "Department stores like Kohl's (KSS) and Target (TGT), and office supply stores like Office Depot (ODP) and Staples (SPLS), are among those that have great seasonal savings." DealScience says some of the best savings on back to school goods are at office supply stores. Shop online for the best prices. If you live where it stays hot, now's the time to take advantage of summer clearance sales. Of course, you can shop for next summer's wardrobe, too. Expect to find deals on sandals, tanks, swimwear, shorts and airy maxi dresses both online and at brick and mortar stores. If you live in a cooler climate and buying summer duds at this time of year doesn't appeal, don't fret. Loads of retailers start fall promotions at the end of July and run them for several months. "Stores like Lucky Brand, Levi's and Lee offer up to 80 percent off before the summer is even over, so now is the time to purchase that new pair of jeans," says DealScience. "Gap (GPS) and Old Navy often cut prices on school styles by 40 percent." Check for specials on outerwear, boots, scarves, cardigans, denim and even belts. According to DealNews.com, mainstream laptops are at rock bottom prices. The site says you can find a notebook for under $400 "with a 15" to 16" screen, at least 4GB of RAM, at least a 500GB hard drive, and Intel's (INTC) Haswell Core i5 processor, which is the company's mainstream chip capable of handling everything from HD movie streaming to casual gaming." "Last month, brand-name 42" LCD HDTVs hit their lowest price of the year, coming in at an impressive $299, which is roughly $40 under 2014's average for this size category," reports DealNews. "Meanwhile, off-brand models of the same size, such as those from Insignia, Sceptre and Sanyo, hit $250, which is the best price we've seen all year for this category." The site says prices will continue to drop in August and -- perhaps -- through November. Linens are a hot buy for both dorm-dwellers and newlyweds. With an uptick in both come August, retailers have blankets, sheets, pillows, shams, duvets, towels and washcloths marked down. Wine grapes are typically harvested in early through late fall, which means that wineries all over the world are putting last year's bottles on sale to make room for the new stuff. Subscribe to your local wineries' newsletters and Facebook pages to stay up to date on specials. Wineries, grocers and major retailers often provide a discount when you buy at least six bottles at a time.